Students who apply and are accepted to this program pursue broader academic interests in a fifth year of tuition-free study. Exceptionally promising undergraduates may be guaranteed admission to our 3-2 BS/MS program in any department in the Hajim School of Engineering and Applied Sciences. 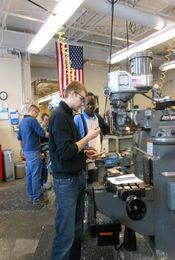 GEAR students receive a minimum 50 percent tuition scholarship in the fifth year of study through a teaching or research assistantship. Designed for engineering and computer science students, this program provides quality workplace experience through paid, full-time employment. KEY students continue their studies tuition-free to pursue entrepreneurial endeavors with the help of the Hajim School of Engineering and Applied Sciences and Simon Business School faculty. Qualified students may propose to devote as much as an entire academic year to internships, special projects, business plan development, research into various factors for a successful entrepreneur, or analysis of how culture and public policy influence entrepreneurial activities. Other opportunities to take science and engineering classes abroad during the academic year are available to students of science and engineering. The Xerox Undergraduate Fellows Program provides engineering undergraduates with an opportunity to participate in a research experience during the summer preceding their senior year.